Home » TSE Podcast Post Page » TSE 438: Account-Based Everything! Account-Based Selling Development or ABSD may probably be a buzzword these days but it is definitely changing the way sellers are selling. 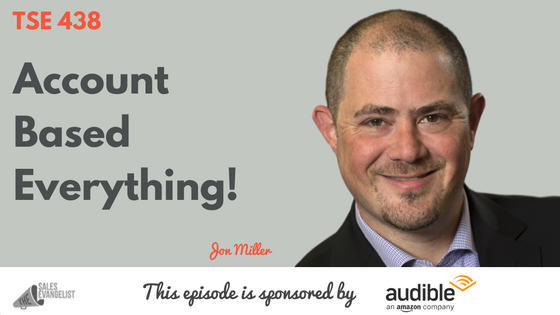 Our awesome guest today is Jon Miller who has another term for ABSD where he calls it Account-Based Everything so listen in to find out why. Today’s guest is Jon Miller, The CEO and Co-Founder of Engagio, a platform that helps people orchestrate human connections. Prior to this, Jon was the Co-Founder and Chief Marketing Officer of Marketo where he spent about 9 1/2 years before he started Engagio. What is Account-Based Selling Development (ABSD)? A real, coordinated strategy combining a personalized, multi-channel, multiplayer outbound activities to ultimately develop high-value opportunities in both new and existing customers. Goes broader than just the sales development team and reaches out to pull in marketing executives and sales teams. Personalized and focused on the big strategic accounts to figure out how are you going to connect and engage with them. Different roles reach out to multiple players of a target account because there are different buyers and different influencers. All avenues are lined up so the right person is doing the right thing at the right time. Relying on hitting a lot of people hoping that a small percentage may be interested in your products. Executives of large companies don’t respond to your generic unsolicited messages. Raise your game and do better than high volume spam. Do something really targeted, researched, and personalized. Reach out across channels and use all of the resources on your team. You need to recognize that this is a process that is about building big deals so it takes time. There is less emphasis on short-term calls to action. It’s not about the number of emails you send during the day but how many meaningful human connections you have with the right people on the right accounts. Are you able to help get a meeting with the right person at the right company? How does ABSD connect to inbound qualifications in terms of the Marketing Qualified Accounts (MQA)? Take a list of accounts you’re interested in and understand accounts. Are you seeing engagement from the right kinds of people? Think about the best way to follow up with that account strategically and leveraging the fact that you’re seeing engagement across different people. The core is to teach something and tailor it so that it is relevant and specific to their business. Find and engage with executives in a way that shares commercial insight and do it in the most effective way. Today, technology lets you orchestrate different interactions with human touches at a much greater scale. Technology caught up with Spam Filters, they can figure out how to block most unwanted spams. Important note: Find a way to raise your game because, soon, anything generic is going to get blocked. Who are you going after? Which accounts and which people? What can you say that’s going to be relevant to those people of those accounts. Where do you start to orchestrate so you can reach out the right people on the right accounts? Do the work to understand who the target accounts are. Spend time to understand the people in the accounts and make sure you’re being relevant. Group these accounts into tiers. Put a lot of effort into the account list to make sure the entire company is aligned on those accounts. Tier the amount of effort you put into different kinds of accounts. First tier: Take out marketing automation completely and only send human touches based on deep levels of account level research. Second tier: Lighter level of personalization. Third tier: Allow some generic automated touches personalized to the industry. Bring in the marketing team. Account-Based Everything is the process of orchestrating interactions across departments and channels to reach their targeted accounts. Why risk the most important people from your most important companies hitting the spam button because you sent them the generic templated message? Find a way to raise your game to stop RoboSpam and do it by making sure that every reaction to your key people is personalized, reviewed, and approved by humans. Check out Engagio and watch their awesome video there! Grab a free copy of Jon’s book, The Clear and Complete Guide to Account-Based Sales Development packed with actionable details and worksheets.